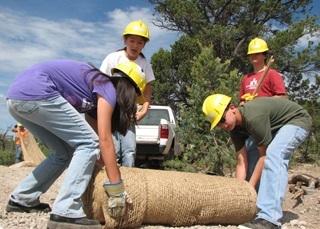 The Y Earth Service Crew (YES Crew) is a Summer service-learning program for youth ages 12 to 15 (Going into 7th-9th Grade). It meets Monday - Thursday, from 8:00am - noon, working on projects to improve our environment and community. Typical projects include work on local trails, gardening, and debris removal. Space is limited to 8 youth per week. Registration opens March 16th. YESC Mission: To empower young people to be effective, responsible, global citizens by providing opportunities for environmental education and action, leadership development, and cross-cultural awareness. YESC Philosophy: Learn by DOING. YES Crew provides a unique opportunity for youth to identify local environmental issues while working collaboratively to engage participants in community action. We combine volunteer service, environmental education, and work experience in a program that focuses on trail improvement, landscaping, watershed restoration, fire ecology, gardening, group work, mentoring, and creative projects. Our supervised Summer program includes opportunities for environmental education and action, leadership development, and cross-cultural awareness.